How many artists out there would be bold and ambitious enough to release three albums in one year, particularly in today’s very fragile music marketplace? Not many, I would imagine, so it’s "three cheers" for Robyn as she has boldly gone where most other artists wouldn’t dare to go. "Body Talk Part 2" is, as the title suggests, the second part of the trilogy. Already well-received by music critics in her native Sweden, who are particularly proud of one of their country’s hottest musical exports of recent years. At a time when female acts seem to be dominating the charts, and you can’t open a tabloid newspaper without daily shots of Katy Perry, The Saturdays, Cheryl Cole etc, Robyn’s profile in this country is still relatively low. Which is just fine: despite her own very striking image, she is still known first and foremost for her music, and continues to compete on her own terms. Where its predecessor opened in confrontational manner with the stark "Don’t F****** Tell Me What To Do", the second album opens in a warm and welcoming manner with "In My Eyes", in which she reassures us that everything will be all right - "....it’ll be OK". This song is better than OK, actually: it’s a perfect example of her effortless style of pop. The good feeling continues on "Include Me Out" which is less electro-pop and more electro-r’n’b, complete with a mid-song rap from the lady herself. "Hang With Me" previously debuted on "Body Talk Part 1" as a ballad, but here it is in all its dance-pop glory. Like all the best pop acts, Robyn knows the value of simplicity in getting her point across, and "don’t fall recklessly, headlessly in love with me" is probably one of the best lines in a pop song for a long long time. Robyn continues to get her point across on the pulsating electro track "Love Kills" which has a very clear message - "protect yourself!" - and a catchy chorus. As with "Body Talk Pt 1" though, things get a little patchy. I wasn’t so impressed by "We Dance To The Beat" which I’d only consider as filler and no more. "Criminal Intent" is a little better, with that hookline "somebody alert the authorities, I’ve got criminal intent", but again it’s not much of a song. On the plus side though, they do show off her versatility as an artist and her hip-hop/dance influences. A guest appearance next from Snoop Dogg, who seems to be a bit of a rapper for hire these days, but at least he gets more to do on this than his recent, lazy contribution to Katy Perry’s "California Gurls". This one merits the ‘Parental Advisory’ sticker thanks to Robyn’s fondness for the ‘F’ word on this one. "U Should Know Better" offers the advice not to mess with her, and I love that lyric "...the whole industry knows not to f*** with me". Both Ms Carlsson and Mr Dogg sound as if they had a great time making this one. Finally, "Indestructible" which, in the style of "Hang With Me" appears here first in ballad form and is promised to return on "Body Talk Part 3" (due for release around December 2010, I think?? ), in its full dance-pop glory. The ballad version is fine - although maybe not as good as the ballad version of "Hang With Me" - but as I always prefer uptempo to ballads, then I’m looking forward to the dance-version will definitely improve the song. Like its predecessor, "Body Talk Pt 2" isn't quite a ten out of ten album, but it's still one of the best recent releases I've heard. Both albums demonstrate the talent and versatility of one of today’s best pop artists. Imagine how good her "Best Of" album will be....in the meantime, bring on Part 3!! So, today it's snowing and a polar bear's just walked past our room window....no only kidding folks, it's the usual - hot hot hot! Another day of hanging out in town. The high temperatures dictate just how far you can walk or how much you can do, but there's nothing wrong with hanging out in town. Earlier in the week I thought there was less of the hard sell than last year, but as I previously said, first impressions can be wrong! It's great fun trying to dodge the power-selling which goes on. ...traditional music, novelty/specialist acts and of course the highlight of the evening - belly dancing. Not only female belly dancers - but a male one too! You don’t believe me? Here’s a picture of a male belly dancer. Sorry it’s a bit blurry, but you get the idea, and it’s very hard to take a photograph when all that...belly dancing is going on. There's a pattern developing here already: hot weather, hotter weather, even hotter weather etc etc. But there is a lot to be said for the power of factor 50+ sun protection, which manages to fight both excessive sun damage and repeated plays of "We No Speak Americano" at the pool bar. It's all good. Above: the Bodrum Mariners' Cafe at the Marina: popular with locals and...us. But the main item on our late afternoon agenda is yet another trip to the hamam - in other words, the Turkish bath. After quite a long journey, the hamam itself is a big hot circular marble room in which we are left to sweat, and sweat, and sweat, maybe for a bit too long until it becomes uncomfortable. After a brief jacuzzi interlude it's back to the hamam where we are all vigorously scrubbed and soap-massaged. If we're being honest, last year's Turkish bath was probably better than this year's, but it's an experience which I'd always recommend if you ever take a trip to Turkey. After the hamam trip, it was time for that other must-have on a Turkish holiday: faithful travelling companion's Turkish shave. In which a rather good-looking young Turkish man removes facial hair with a large razor. At the time of the shave, "Prayin'" by Plan B was the song playing on the radio, and no, the irony was not lost on me. Happily, faithful travelling companion emerged smoother and unharmed. Job done!! Dinner tonight at yet another one of those restaurants where we dine at the water's edge. Very nice! One thing I must mention about Bodrum is the abundance of cats, there are hundreds of them, and they will prowl around the restaurants and be your best-friend-forever if there is any possibility of some leftovers from your plate. I've never really been a cat lover, never had a pet cat or anything, but I've been getting just a little broody here. As if it's not enough having a town full of gorgeous men and beautiful women, even the cats are gorgeous, and I want to take one home with me!! But the sun is shining, and we're centrally located in Bodrum, so let's explore. "Bar Street" is the main street in Bodrum - actually a mix of two streets which run from the beachfront to the marina - and is a mixture of bars, restaurants, clothes shops, souvenir shops and the legendary 'genuine fakes' although there are less immediate bargains to be had here than in İçmeler - none of that "two for a tenner" stuff here! On our first day it felt like there was less of the 'hard sell'...first impressions can be deceptive though! The immediate and lasting impression is of a cosmopolitan resort, attracting tourists from many countries and also from Turkey itself. That's probably the first difference I notice between Bodrum and İçmeler, which seemed to attract more British tourists. The other difference I notice is that Bodrum is a real, working town and not just a holiday resort. Wherever you are in Turkey, you'll never forget where you are. Turkey has a uniqueness which you just don't get anywhere else. None of this "British fish and chip shop" rubbish. And it has pide - Turkey's own version of pizza. Ooh....it's time for lunch! After lunch we do some more exploring, and walk to the other end of the beachfront, as far as the famous Halikarnas open-air nightclub (tagline: "You can not say you've been in Bodrum if you haven't been to Halikarnas"), take a back-street wander and then back via the many beachfront restaurants all competing for trade. Aah yes....the hard sell. But in this heat (a boiling 33 degrees) you need to stop for a cool drink in the afternoon. On return to the hotel we discovered the Power Turk TV channel - a music channel playing all the latest hits. For a fan of European music like myself, this was like striking gold. We discovered so many new songs and artists thanks to this channel, and it also helped to inform my CD purchases in the coming week.....! Catch up with the latest Turkish top 40 at http://www.powerturk.tv/. In Bodrum, Bar Street is the place to be, morning, noon and night. There are many restaurants between the beachfront and marina, some of which are quite upmarket, but all of them have one thing in common - you enter the restaurant on Bar Street but you dine at the seashore. Just don't lean over toooo far....oops! Man/woman overboard :))) We had dinner at one of these restaurants tonight - very nice. One particular thing which appeals to me about Turkey is the wide variety of dishes available in restaurants, which cater to all tastes. That is certainly the case in Bodrum - there's something for everyone, although less of the set menus found all over İçmeler. We round the evening off with a seafront drink - it may only be a Tuesday night, but there's a lively party vibe going on. But not too much partying for us tonight - need to catch up on sleep!! Second consecutive year of our summer holiday in Turkey....but a different destination. In 2009 it was İçmeler, which left a significant and lasting impression on us, and it was very clear that we would return to Turkey again some day. However, we looked at other destinations for our 2010 summer holiday, but when these didn't work out, Turkey became an obvious alternative. But how about same country, different destination? I had been intrigued by Bodrum, which offered a mix of historical attractions and a party atmosphere. An interesting contradiction. After further research, it became very obvious that Bodrum would meet our needs. Bodrum is situated on the Aegean Coast of south-west Turkey, and the Greek island of Kos is just an hour away by ferry. Bodrum's famous landmark is the Castle of St Peter, built in 1402 (pictured above) - a centrepiece which divides the seafront: on one end is the beach and on the other side is the marina. As we had a night flight to Bodrum on Monday 13th September, we didn't arrive till the early hours of Tuesday morning, therefore day 1 of this diary will be Tuesday. You can also hear a short clip of the new song at www.chartsinfrance.net and in full at http://www.youtube.com/watch?v=Pm1Jg2gaw3k (no video yet but I guess this is still to come?) As usual with many of Jenifer's songs, it didn't really make an impression on me after one hearing, but I've heard it about three times now and it's already beginning to grow on me. Some choppy guitars, some well-placed handclaps (and you know I'm partial to them!) and even a bit of talking/rapping too = a catchy foot-tapper, although it's a long, long way from the original Jenifer-style. (If you heard this and didn't know who it was, you wouldn't really guess it was Ms Bartoli). I'm feeling so 'out of the loop' with French music now, and really need to catch up. Maybe I'm missing out on something special. If anyone has any tips on good new French pop music then these would be very welcome. ....got back this morning from a fabulous holiday in Turkey, had a brilliant time although the daytime weather was just a bit too hot, so I'm cooling off now! Spent most of the day catching up with the sleep I didn't get thanks to that night flight, and tonight I've been catching up with everything else that I've missed in recent days. Anyway, I go away for a week and come back to discover that last year's X Factor winner Joe McElderry has only gone and covered Donkeyboy's "Ambitions", the original version of which has been one of my most loved and most played tracks of this year. I'm pleasantly surprised by this, as it's a pretty decent version and a vast improvement on the usual r'n'b-influenced dross being churned out at the moment. I recently read that he's been working with Darin too - could Joe become the nearest thing that we have to a Swedish boy-pop star? I hope so! What else did I miss? Well, Lena Philipsson got married, Reinfeldt got re-elected in Sweden, and 5% of the Swedish voting public are very sick, sad people indeed. I'm off to bed (again) now for tonight's sleep. Goodnight! Regular readers of this blog will know that I haven't been posting as much on here, and unfortunately that's set to continue for a little while so please bear with me. It's a very, very busy time at the moment - having a new central heating system installed, and then I'm off on holiday! Yes! It's that time again...on Monday I'll be heading off to Turkey - along with faithful travelling companion - for our second annual summer holiday there. Can't believe it's been a year since our first visit to Turkey and we hope that this holiday will be as fun and memorable as that last one. Hopefully I'll be home with some new Turkish music among my many purchases! All things being well, this blog should return on the evening of 21st September. If there's any important news I've missed when I'm away (I won't be near the internet during that week) please get in touch and leave your comments and I'll get back to you on my return. See you later in September......! The 31st annual Rockbjörnen awards ceremony, organised by the Swedish newspaper Aftonbladet, and voted for by the public, took place in Stockholm last Wednesday, 1st September. The focus of this year's awards was on live music, and included the recent series of virtual concerts - "Live-löpet" - which as you know I had mixed feelings about :) anyway this year's ceremony took place in a tent on Djurgården and had a little 'downmarket' feel to it, but, hey, rock n' roll!! Only it wasn't really too rock n'roll: the ceremony should maybe have been renamed "Popbjörnen" as many of the acts, whether nominated, winners, or performers, were more on the 'pop' side. The ceremony was presented by Linda Sundblad who brought the right amount of rock-chick glamour to the evening with a selection of costume-changes, some more bizarre than others! My major problem with the show this year was that it was just far too long, at over three hours. The length of the show didn't justify the amount of awards being given out - and more time seemed to be spent on mingling/backstage interviews than actual 'awarding'. Anyway, onwards to the first award of the evening, for Årets Svenska Låt - best Swedish song of the year. Of course you'll know which song I wanted to win in this category - "Keep On Walking" by Salem Al Fakir, which, for me, is the best Swedish song of the year. However, the public vote went to "Från Och Med Du" by Oskar Linnros, who launched his solo career earlier this year and has had a phenomenally successful summer. His debut album's been well-received by both critics and the public alike. If Salem hadn't won in this category, I wanted Oskar to win it so I was pretty happy with this result. In any awards ceremony where the public vote is involved, it's inevitable that the acts with the biggest fanbase end up with the prize. 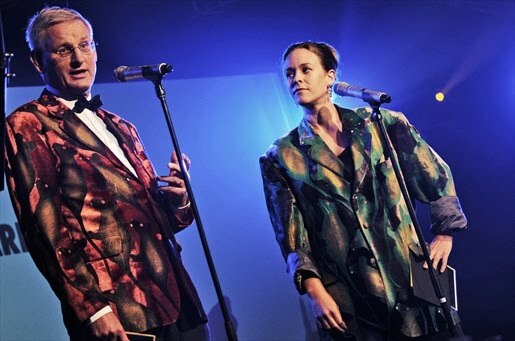 And so it was for Årets Konsert - concert of the year. The award went to Tokio Hotel, who still have a massive fanbase, although personally speaking I'm not so keen on their music as I used to be. The award was presented by Aftonbladet's music columnist Markus Larsson, I wouldn't imagine Tokio Hotel would get much airplay on his CD player....anyway the band weren't there to pick up their award as they are touring at the moment so accepted their award with a video message. The next award - Årets Utlandska Låt - international hit of the year - also went to Tokio Hotel with "World Behind My Wall" which I can't recall being such a big hit in the Swedish charts, but that's fan power for you, yet again. As I said earlier, there was a bit too much time spent on backstage/mingling interviews but it wasn't all bad, as some of the celeb-spotting was fun - oh look, there's Måns Zelmerlöw looking very nice in a black coat! 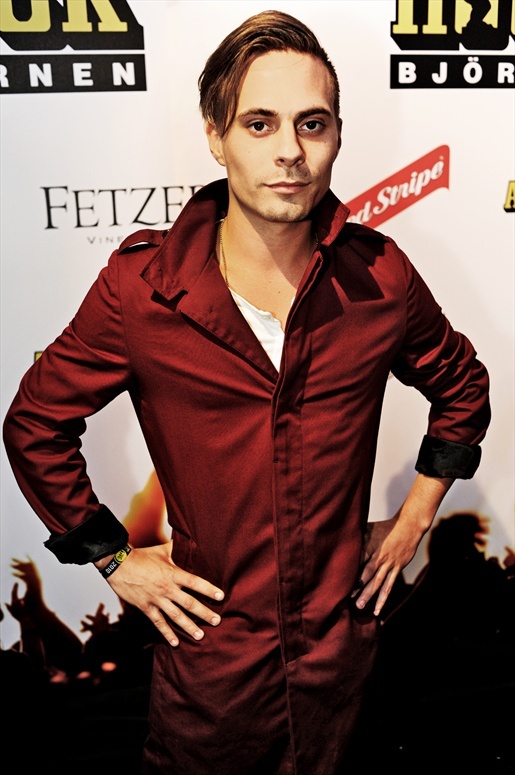 - and Sean Banan was, um, "bringing up the rear" (you wouldn't get that at the Brit awards would you!!). 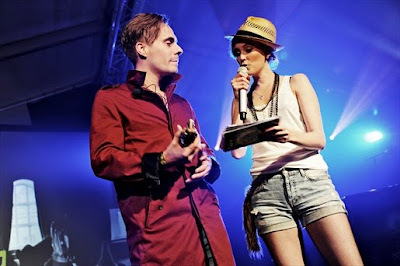 But back to the awards: Årets svenska livegrupp - best Swedish live group - went to...Kent. Oh, quelle surprise. I do like them, but it does get a bit predictable with them winning all the time. Årets kvinnliga liveartist - best Swedish female live artist next. And the award goes to....Robyn! Oh what a good choice! However she wasn't there to pick up her award as she is on tour, but sent a video message. Next live act on stage was none other than Eric Saade, with "Masquerade", "Break of Dawn" and finally, the song which he'll always be remembered for - "Manboy". He performed a very professional set and gave a better live performance than I was expecting from him: very professional. The prize for - Årets festival - Festival of the year - went to the organisers of Peace and Love. Then it was time for the second award of the evening for Swedish music's brightest new star, Oskar Linnros - Årets Genombrott - Breakthrough Artist of the Year. Well done Oskar!! 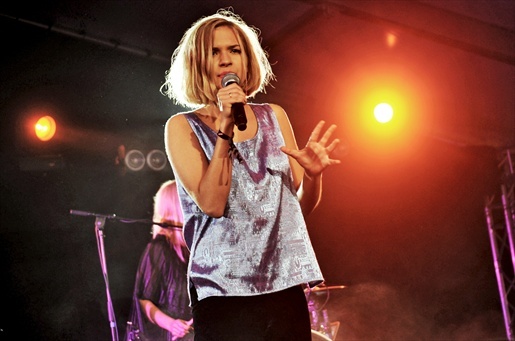 Next live act of the evening was Tove Styrke. The Idol 2009 runner-up is now launching her solo career with her debut single, the very catchy "Million Pieces". She has so much charm and charisma, but something seemed to go very wrong during her performance and it all went off-key. I wondered if she maybe lost her earpiece or was there another problem with the sound? ...the final award of the evening, the award for Årets svenska manliga liveartist - Swedish male live artist of the year. Again I'd hoped that Salem Al Fakir would win this one, he's had a fantastic year during which he has won the hearts of the Swedish people, and had a long, successful summer tour. However, it's another one of those categories where the presence of Lars Winnerbäck is enough to guarantee an award. I don't really understand Winnerbäck's appeal, but each to their own, I suppose. The final live act of the evening was Hoffmaestro & Chraa. I'd heard of them, but hadn't heard their music before. It felt as if there was about 20 of them on stage (!) and they certainly provided a lively conclusion to the evening's proceedings. OK, time for some photographs. These red-carpet and onstage shots are all courtesy of Swedish celeb-spotting website www.stureplan.se - enjoy! Above: man of the moment, Oskar Linnros. Above: my vote for Årets svenska livegrupp....Salem, Adam, Jakob and Nisse! Above: Oskar Linnros and Linda Sundblad. Above: Carl Bildt and Maria Wetterstrand's complementary comedy jackets. 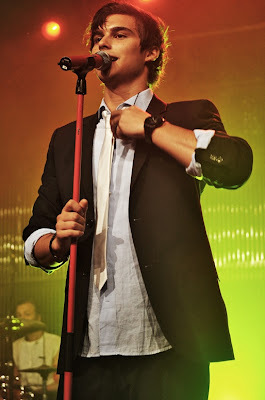 Above: Eric Saade, on stage. Above: Tove Styrke on stage. Would any one of my Swedish readers be able to answer this question? 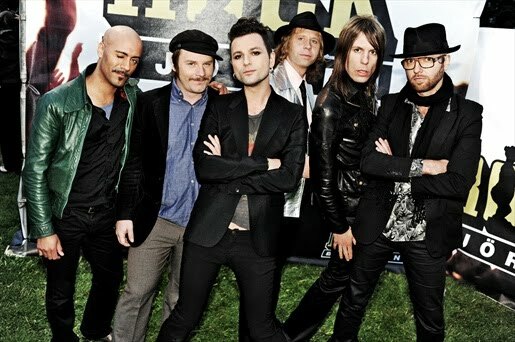 I was wondering if the Swedish band Kent had ever released a live DVD in the past or are there any plans to release one? 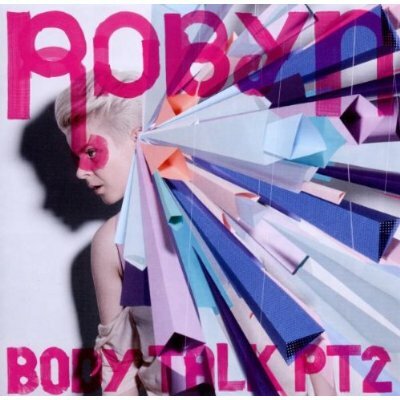 In My Eyes/Hang With Me - Robyn: two highlights from "Body Talk Part 2" which are inevitably great. All Day Love - Salem Al Fakir: this has been the soundtrack to my summer. A heartfelt, inspiring and beautiful song, that's all. I can only hope that one day, it reaches a wider audience. Bang Bang Bang - Mark Ronson, Q-Tip & MNDR: a very addictive return. Mr Ronson, you have been missed. According To You - Orianthi: already 8 million views of her video on YouTube - she was previously Michael Jackson's guitarist, a very talented musician and now a solo star in her own right. Very similar to Kelly Clarkson's "Since U Been Gone" but that's not such a bad thing. F*** You - Cee-Lo Green: this might not be big, or clever, but I totally love this song!! Best use of the f-word in a song for a long, long time. It's all over YouTube, which is just as well as you'll probably never hear the uncensored version on British radio. Bang Bang - K'naan featuring Adam Levine: a catchy, foot-tapping follow-up to "Wavin' Flag" which I liked after a couple of hearings. A very recognisable Levine chorus too: much better than most of the r'n'b/'grime' rubbish cluttering up the charts at the moment. Swedish "Idol" is back on 7th September! That's the last 4 months of the year sorted then :) The new season of "Idol" starts this coming Tuesday at 20:00 Swedish time on TV4, with the traditional audition-phase to begin with.